Press bushing #36 and (3) wooden pins #38 into front plate #35. Insert shaft #34 into gear #33. Assemble washer #32 on brass shaft #34. Insert assembly into bushing #36. Place gear #40 flat on table and press in bushing #41. Press hour hand #43 onto bushing #41 (slip fit). Place gear #40 onto bushing #36. Place washer #44 onto shaft #34. Press minute hand #45 onto shaft #34. Do not press on all the way or gears will not turn. Press (2) steel pins #46 into the back of the front plate #35. Press gear #37 onto brass shaft #12. Check if all gears rotate freely. 12 mm or 1/16" inside the sprocket wheels #18 and #20. Cord should be retained by the (2) steel pins #46 on back of front plate #35. Slide (1) heat shrink tube #55 onto each end of cord. or heat gun until it shrinks onto cord. (DO NOT hold above flame). frame #50. (Lower ring should be about halfway up the frame). 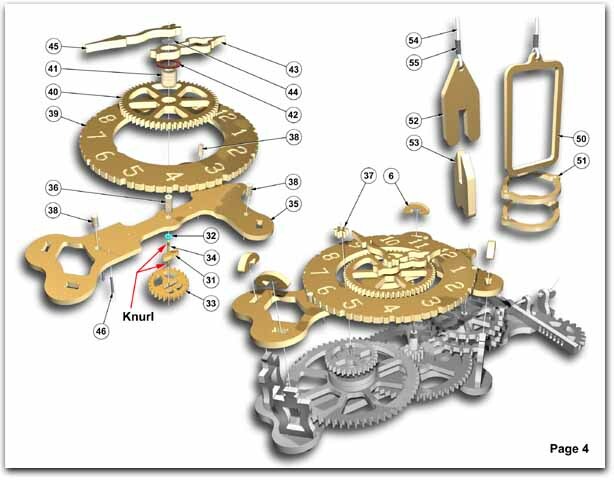 #7 is about half way up the teeth of escapement sprockets #18 & 20. Replace wedge #47 making sure the string is positioned in the middle of the square hole. the small weight (counter weight) is approximately 100 grams.